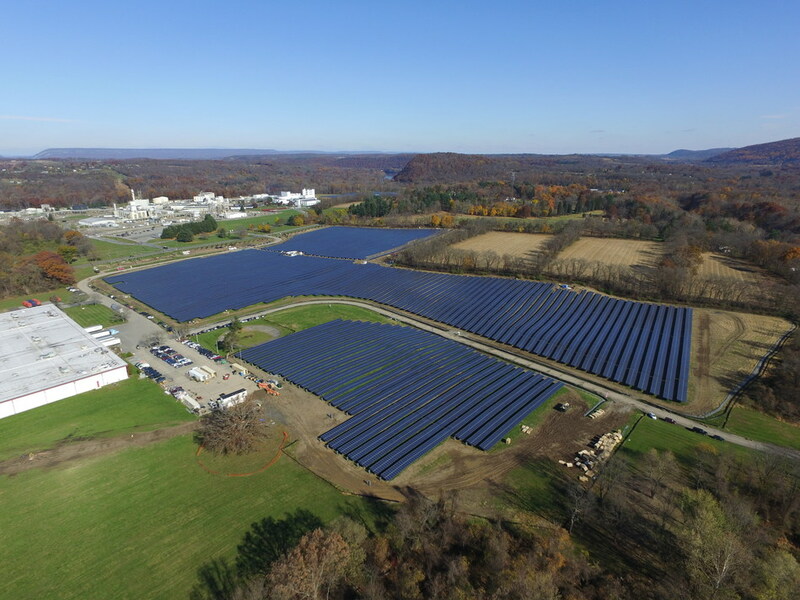 DSM North America's newly expanded 66 acre solar field in Belvidere, New Jersey. The new solar expansion triples the size of the phase one solar field, and will effectively triple the solar output at the site by adding an additional 46 acres and over 42,000 solar panels. At peak production, the maximum output of the DSM solar facility will exceed the site's peak consumption, with the excess solar power being sent to the power grid during those times. "The newly expanded solar field is part of DSM's commitment to doing well by doing good for both our communities and our environment," said Hugh Welsh, President and General Counsel of DSM North America. "It will minimize our impact on the planet through clean, renewable energy and allow for sending enough green energy back to the grid to power 406 homes for a year. At DSM we are proud to do our part to move the state of New Jersey and our country toward a clean energy future." As a member of the RE100 initiative, DSM has a goal to source 100% renewable electricity for its global operations. Led by The Climate Group in partnership with CDP, RE100 brings together the world's most influential companies committed to 100% renewable power. "DSM is a prime example of an RE100 member investing in pragmatic and impactful projects by cutting emissions from its operations and greening the grid to the benefit of local communities," said Sam Kimmins, Head of RE100, The Climate Group. "By expanding its Belvidere solar field to triple the size, DSM sends a powerful message that the business case for renewable power continues to grow—showing the wider business community that the clean energy transition is happening now, and won't slow down." "We're proud to be an integral part of DSM's commitment to sustainability and thank DSM for trusting us to develop and construct another solar project. Over the past few years, GeoPeak Energy has partnered with DSM to implement key objectives of its sustainability plan, including this 20MW Solar Project," said AJ Javan, Partner of GeoPeak Energy. "This is a prime example of the planning and execution that is required to complete the construction of a complex project of this scale." DSM partnered with GeoPeak Energy to develop, engineer, and construct this newly completed expansion of DSM's Belvidere solar field, which increases the offset of CO2 emissions of electricity from the grid to more than 17,400 Metric Tons annually.The 20MW solar fields will reduce 38,360,434 lbs of CO2 annually, which is the equivalent of the CO2 emissions from 1,962,666 gallons of gasoline consumed, 2,614 homes' annual electricity use, and the carbon sequestered by 20,544 acres of US forests.The panels use DSM's own anti-reflective coating for the solar glass that increases efficiency by up to 3%. This technology is already in use at DSM's operating solar fields in Kingstree, South Carolina and Pune, India. From 2016-2017, DSM's purchased electricity from renewable sources increased from 8% in 2016 to 21% in 2017.All of DSM's operations, across six continents, are moving to 100 percent renewable purchased electricity including solar, wind and hydroelectric. DSM is committed to sourcing 50% of its electricity from renewable resources by 2025.DSM achieved 26% greenhouse-gas efficiency in 2017 compared to 2008. And DSM has improved its energy efficiency by 3 percent since 2015. GeoPeak Energy, headquartered in Somerset, New Jersey, is a solar energy and sustainability solutions provider, specializing in solar design, engineering, project finance, project management and construction for customers that are seeking immediate results for their sustainability goals through the reduction of CO2 emissions and long-term savings. GeoPeak Energy has developed, financed and installed nearly $200 million in New Jersey solar projects, including the largest net-metered solar project on a manufacturing site. GeoPeak Energy has been a trusted solar partner for the financing and installation of solar projects for public entities such as school districts, waste water treatment facilities, municipalities, landfills, mid to large companies, and Fortune 500 multi-nationals. GeoPeak is ISNet safety certified, with PMP Project Managers, construction managers, and NABCEP certified personnel on staff. GeoPeak Energy's competitive advantage is our innovative solutions and designs, which consistently result in larger solar projects and greater savings for our customers. GeoPeak has received numerous industry recognitions for achievements, market leadership and unique product and service offerings, including New Jersey Private Company of the Year.